Amy Jo Jennings is an aspiring folksinger all too fresh from the hills and full of dreams of being a big star. But besides being very na�ve, Amy Jo is also very rich, having inherited her father's successful Home Folk�s Remedy Company. This explains talent agent Harry Bronson�s interest in her. He�s offered her a starring role in a cross-country musical�for $50,000, that is. Amy Jo finally wakes up and smells the coffee at a swinging party at Bronson�s house thrown by Bronson. She goes looking for Bronson at his house, but he appears to be asleep. Actually, he�s dead. As Amy Jo has the best motive for the crime, she's soon singing a sad song of murder to Perry. This episode features Gary Crosby (Bing�s son), Lee Meriwether, and Mark Goddard, who portrayed Don West on Lost in Space. Location: About halfway through this episode, Della is on the phone with Paul in his car. Paul is driving south on Malibu Road. He has just passed the old Vet Clinic and is heading toward Webb Way. The Malibu Colony is just to his right. If you would like to see photos of a very similar scene go to Episode #201, TCOT Frightened Fishermen. Posted by Eric Cooper and Linda Shockley, 8/3/2009. Location: About 6 minutes into the episode, Jazbo gives Amy Jo a ride home. He turn off Santa Monica Blvd. and continues north on 1100 North Orange Grove Ave in West Hollywood. In the background you can see over Jazbo and Amy Jo's heads the 7836 and sign of the Hollywood Used Clothing store on Santa Monica Blvd (now Chevra Kadisha Mortuary.) If you Google-map 1102 North Orange Grove West Hollywood and then reverse the angle, you will see aproximately the same view as you get in the episode. Also you can zoom in for a closer look. This location is a few blocks from Plummer Park featured in Episode #101. Submitted by Eric Cooper, 19 August 2010. Some pictures here. Lee Meriweather had been crowned Miss America in 1955. jfh 17Feb2017. Goof: The lettering on the office door spells it �Seibring� while the credits have �Siebring.� Submitted by daveb, 11/23/2010. +Grammar rule:"I" before "E" except after "C"...or German rule "EI's" are "I's" and "IE's" are "E's"... ;-) Submitted by HamBurger 10/08/2016. Gary Crosby had a short, sad life. In his autobiography, he details abuse inflicted by his mother and his father, Bing Crosby, who disinherited him. He was only 62 when he died of cancer. Submitted by gracenote, 4/19/2011. Sightings In the table way in the back of Hillbilly Haven (but somewhat elevated) is Distinguished Gentleman #1 with yet another ladyfriend. He shows up again at Bronson�s party�but with glasses and sitting at a table by himself with his back to the camera. When the dancing starts, he�s in the back, groovin� to the music but sans spectacles. We see him a third time at the bar, again no specs. Submitted by gracenote, 4/20/2011. + At the hearing we see the Gentleman again, along with Quiet Old Man #1 and Pencil Mustache Man, who is very prominent in several cutaways. He looks as pensive as he ever does. Submitted by gracenote, 4/20/2011. Uncredited Actors: Don Anderson shows up at Bronson�s party, too, as does the distinguished Bess Flowers. (See above). One of the young men at the party is Christopher Riordan (currently on the TV show Outsourced), according to IMDb. Submitted by gracenote, 4/20/2011. + Jazbo Williams may live humbly, but he is chic enough to entertain with that Curious Coffee Set which turns up in many an episode of Perry Mason. Submitted by gracenote, 4/20/2011. Once again, Ray Collins is credited for playing Lt. Tragg, but that venerable detective makes no appearance. Submitted by gracenote, 4/20/2011. Music: When Jazbo and Amy Jo are talking at the party, the band is playing-and people are dancing to-rock music. I believe this is the first occurrence of rock music on Perry Mason. Is it the only one? Submitted by 65tosspowertrap, 1-9-2014. + No, it is not the only one. Submitted by 65tosspowertrap, 2-23-2014. +++ TCOT Scarlet Scandal, #261, also has rock music. Submitted by D. Tlougan, 4/28/15. 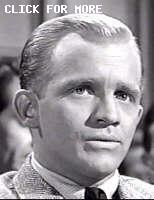 IMDb notes that "Singer in Nightclubs" was 1 of Raymond William Stacey Burr's Pre-Acting jobs. Mike Bedard 3.8.15. Mark Goddard�s Southern accent is terrible. Bonnie Jones�s isn�t much better. Submitted by gracenote, 4/20/2011. Fender Telecasters were not exactly the guitar of choice for folk ensembles of the day (though they have always been a staple in blues and country music). Even more amusing is the opening jam. The audio track is one acoustic guitar playing chords and electric guitar (presumably the Telecaster) picking a lead. Despite that sonic reality, the Telecaster guitar is not plugged into an amp and the guitarist is happily strumming chords along with Jazbo. Submitted by Mason Jar, 9/12/2011. An unusual number of noirish closeups in this episode. Anything to sell more newspapers -- The Los Angeles Chronicle has a big photo of the face-up dead body, above the fold on page 1, below the big headline HOLLYWOOD AGENT SLAIN. Something for parents to explain to their kids, 4 weeks after Martin Luther King was awarded the Nobel Peace Prize. Submitted by (lowercase, with a comma and period) masonite, 12/17/12. Only 3 weeks previously, Mississippi's Mary Ann Mobley, Miss America 1959, starred in TCOT Blonde Bonanza. She, rather than New York's Bonnie Jones, could have more convincingly played the freckleless hillbilly, giving the show's promoters 2 recent Miss Americas in the same episode. (And the feckless Mr. Bronson could have had both under contract at the same time.) Submitted by (lowercase, with a comma and period) masonite, 12/17/12. Bad Acting:Is it me or does Joyce Meadows appear to be forcing the drunk person a little too hard? Submitted by HamBurger 10/08/2016. Blackmail 101: Another dumb blackmailer killed by his payer.